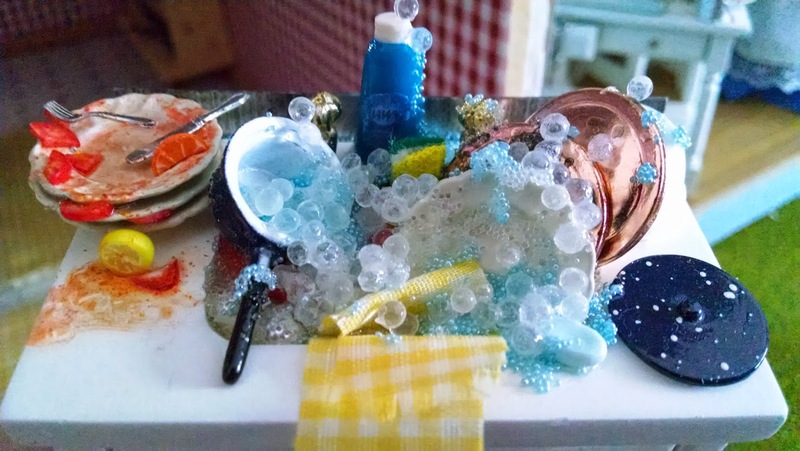 Welcome to my collection of 1:12 scale miniature food made with love (and polymer clay) - for dollhouses or admirers of all-things-mini. In life, it's the small things around you that matter the most. Embrace, enjoy, and savor every second with all your might. Hello everyone! Hope you are all having a beautiful mini making day! Just wanted to dash off a quick post to show off some of the wonderful minis we found online. 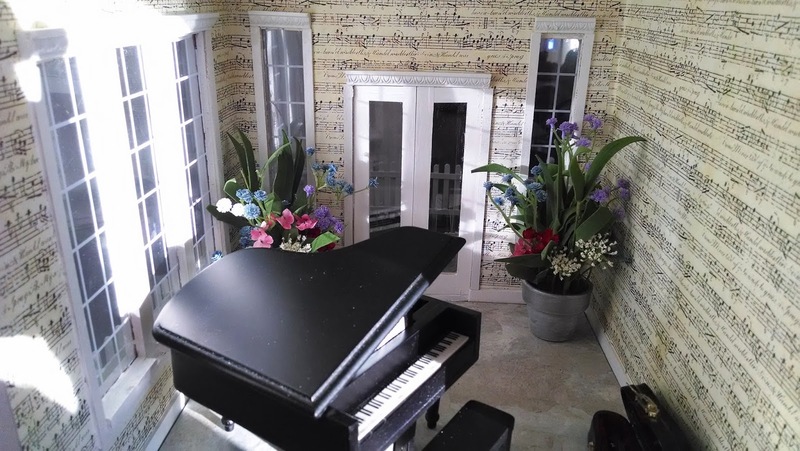 Our daughters play the violin and the piano, so of course their dollhouses HAD to have music rooms too. 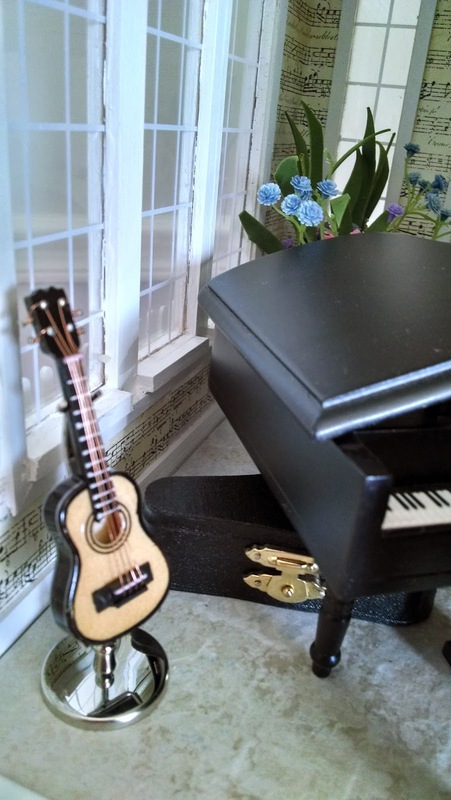 We already had a mini violin and piano and needed more instruments to expand the symphony. These photos are on my Pinterest board too. :) All minis are in 1:12th scale. 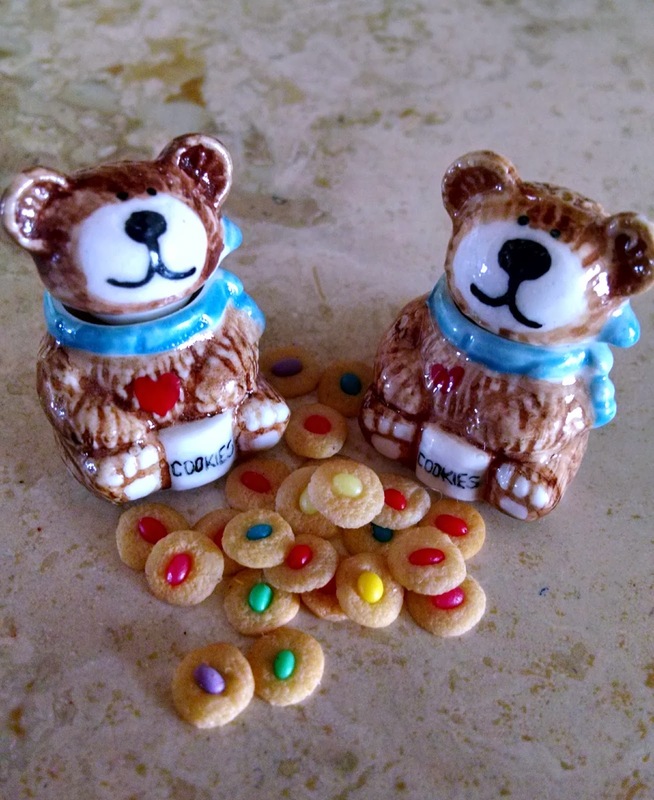 Filled with our chocolate chip and jelly bean cookies that we made from polymer clay. 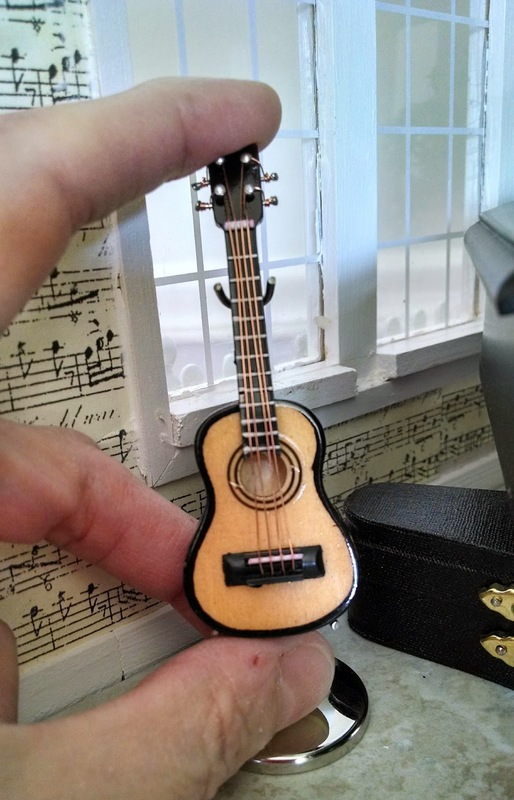 A 1:12th scale guitar from eBay. 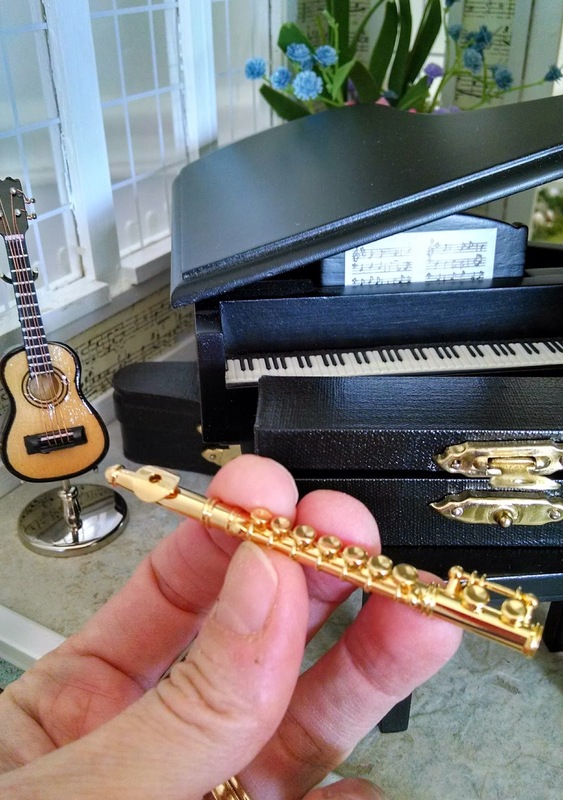 A lovely 1:12th scale flute! 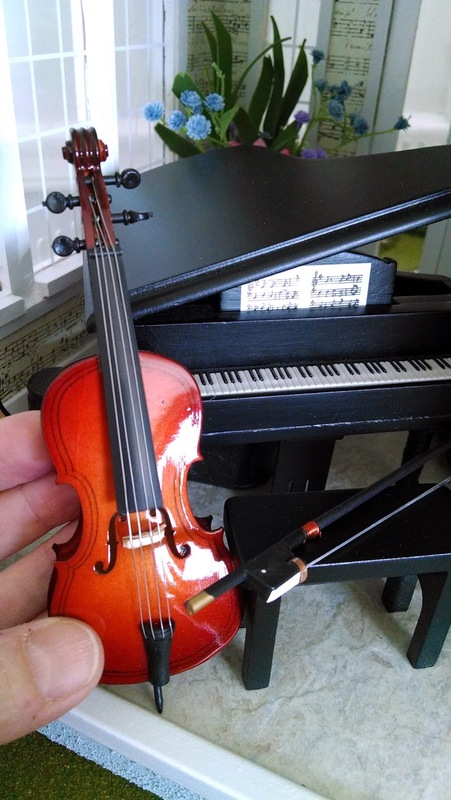 An amazing miniature cello in 1:12th scale. The details are stunning! Right down to the foot on the bottom. 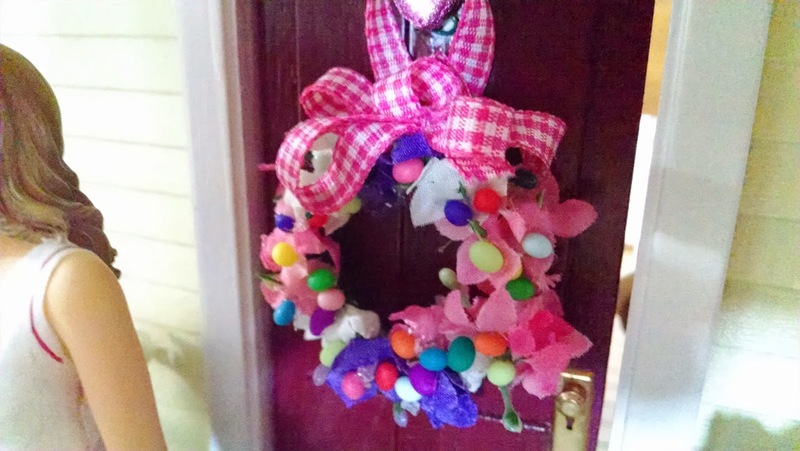 Easter will be here before we know it...how about a nice spring flower and Easter egg wreath for the front door on the farmhouse? 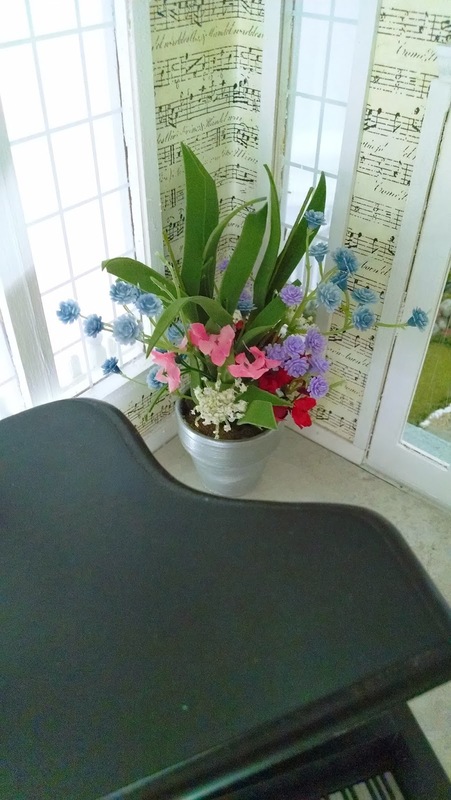 Springtime flowers and plants for the music room too! The third floor of the farmhouse underwent a renovation, this time, we did it right with the orientation of the room dividers and different wallpapers for each room. Ahhhh....we like this much better! A.C. Moore had these on sale - miniature board games (they're really key chains, but shhhhh...we don't have to tell...LOL). They're not quite 1:12 scale, but darn close enough. ;) The Life game spinner really works! Total awesomeness! The Monopoly board is magnetic, so the tiny playing pieces and dice stay put. No money or Chance cards yet, a good mini printies site should help us take care of that detail. 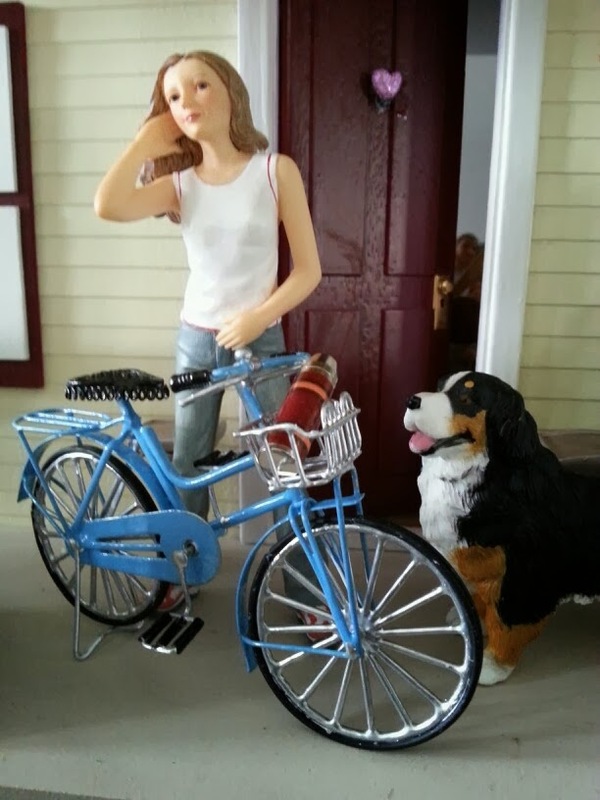 Mini 1:12 scale bikes painted to look a little more realistic. We're ready for spring now. :) This one we found on Hobby Builders Supply. 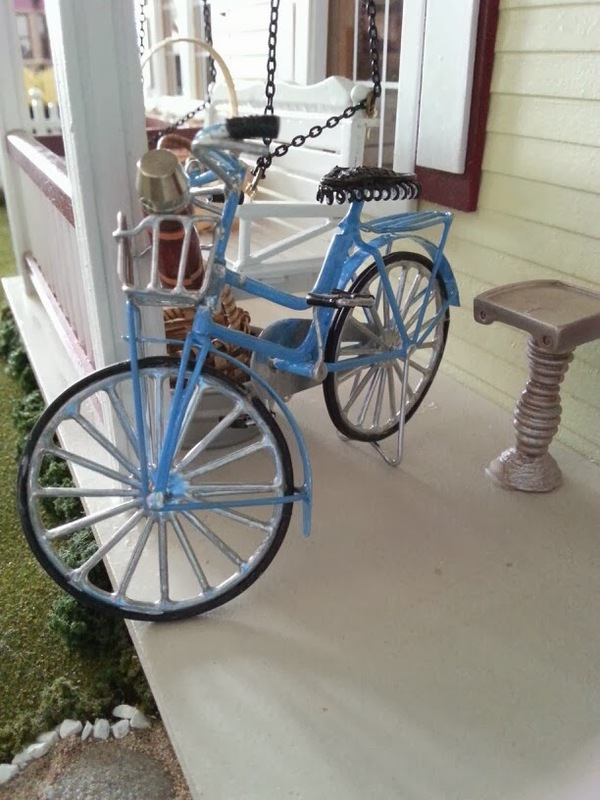 It was all white before we painted it blue with Testors enamel paints. 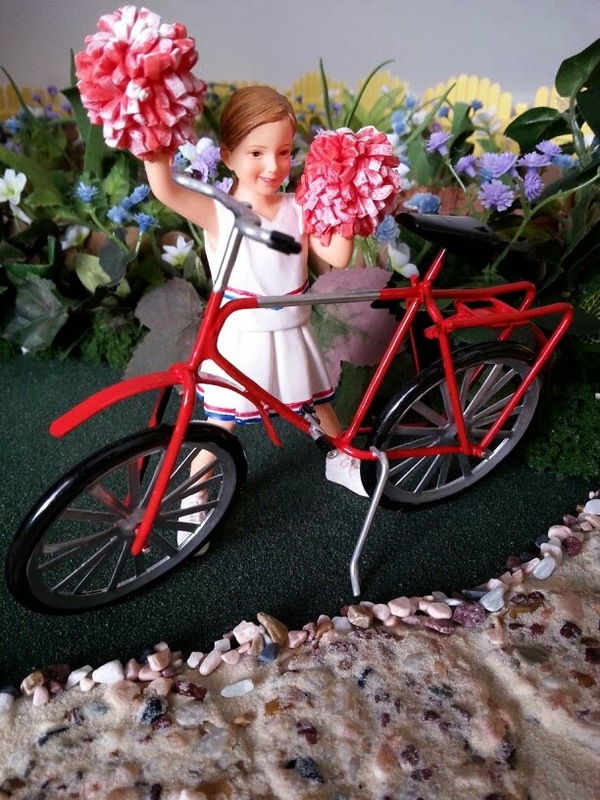 And this bike was at Hobby Lobby, it was black, now painted red. A thermos full of coffee in the bike basket - java juice is vital for those early morning rides in the spring sunshine. 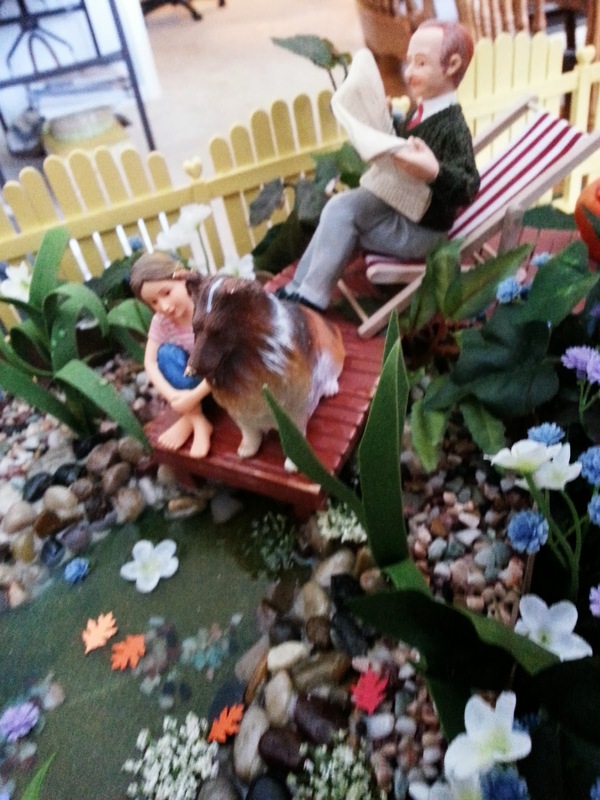 The natural swimming hole for the Victorian dollhouse got finished...yay!!! 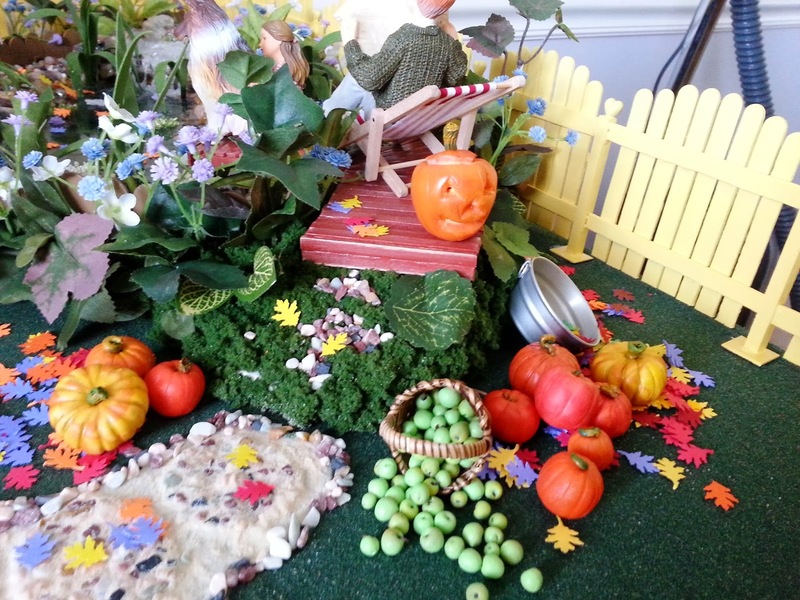 Found a LOT for Christmas minis as a Miniature Yard Sale last fall - amazing and very reasonably priced. The natural swimming hole and diving pier is all frozen over for winter....brrrrrrrr! Each tree was decorated in a "theme" - the music room tree had tiny gold music ornaments. Gosh those micro mini lights are so bright! And they plug in to a regular wall outlet too - easy peasy to hang on the houses and no changing batteries! The wire is almost invisible because it's so thin, and very "bendy" - easy to put in place. It's been a while, wow, make that a loooong while, since I eeked out a post. 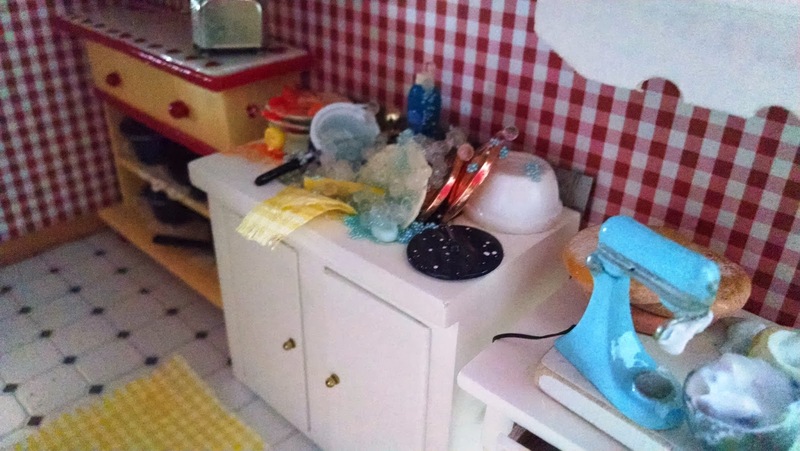 I miss "blog-dom" and I'm way behind on either of my daughters' dollhouses and any dollhouse miniature foods I've been dreaming of creating. It's the lupus. Always the lupus. :( Drat!! And this summer was no different. Hot weather = exhaustion. Mind numbing, OMG can't keep my eyes open, exhaustion. And the swelling and stiffness, in fingers, and feet. Flares make it impossible to spend any real amount of time working on my mini worlds. So with the kids back in school since last week I'm looking longingly at my long neglected mini yards. Going to attempt something I saw online that appears to be all the rage in residential swimming pools in the U.K. (and starting to catch on over here in the U.S.) - natural swimming pools? They are really cool and beautiful as they fit right into the natural landscape. 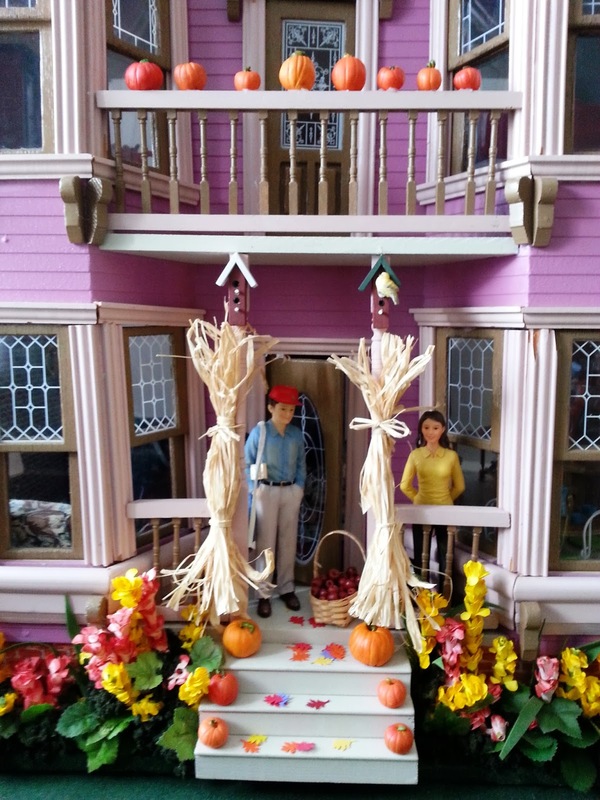 This would be perfect for the Victorian dollhouse. One, because the table my husband placed this dollhouse on is larger than the table under the Vermont Farmhouse Jr., so there's plenty of room, and two, since the little doll "family" that "lives" in the Victorian are doing some wonderful rehab with what could theoretically be a two hundred year-old home, I thought they would be the type of "homeowners" to tackle a natural pool project that will blend into what-will-someday-be a very naturally landscaped yard (hopefully with a Real Good Toys Gazebo - oh how we dream.) And besides, this natural pool creation will give us a great excuse to use up the sand, Styrofoam, and bags of mini-rocks we've had in the craft cupboard for years. Now the really BIG question is, how long will it take me to finish this project? Ha ha, only the lupus knows. ;) And I'll probably get a hand or two from my kids when they are not swamped with sports or homework. The nice thing about miniatures is that I can do what I can physically manage, if it's 15 minutes, only 5 minutes, or oh boy, maybe even a whole hour on a rare occasion...and when my fingers lock up and stiffen from the strain of the work I can put it down, push it all aside and rest until another day. No pressure. I just work on the projects as am I able. Here are some photos to show the progress on the natural swimming "hole"....click on the photos to enlarge for better viewing. I had a LOT of help with cutting, gluing the rocks was easier, but we got the job done. Thanks so much for stopping by my blog. <3 <3 I love all your wonderful comments! This is how it all started. I'm not a "saver" by any means, I pick and choose stuff I want to save for crafts. Lucky this Styrofoam and rocks and sand were something I thought worthy of saving years ago. 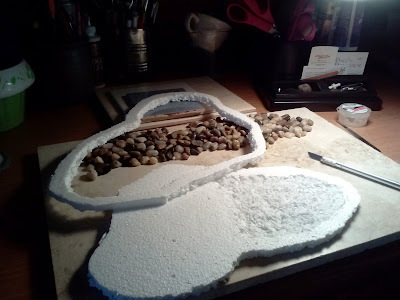 Anyway, I glued that outer ring to the larger piece of Styrofoam (the bottom of the pool), and waited till it dried. Leftover artificial spring grass from Woodland Scenics came next. Hit it with a hair dryer on "hot" setting and it molds to the Styrofoam base. That huge rock to the left is something my now 16-year-old picked up when we were hiking in the mountains, about 10 YEARS ago...at least it reminds me that at one time I was able to hike. :) Good times, yes, good times. And there's the huge rock my daughter found and carried home in her jacket pocket when she was about 6! That is going to be the waterfall. Of all the rocks she used to pick up on hikes and collect, this was the one I saved and found hiding in the corner of my desk. 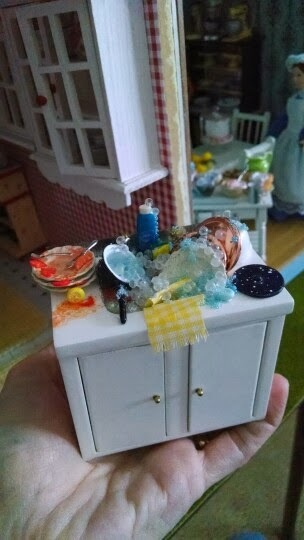 Kind of cool to incorporate it into her dollhouse swimming pool now. After gluing the rocks around the edge, we sprinkled some light sand so it would stick to the glue in between the rocks and give the appearance of some kind of mortar. We'll brush out the extra sand later when everything is securely dried together. Adding some plants because these are what actually help "filter" and clean natural swimming pools. These sprigs are all I have for now. 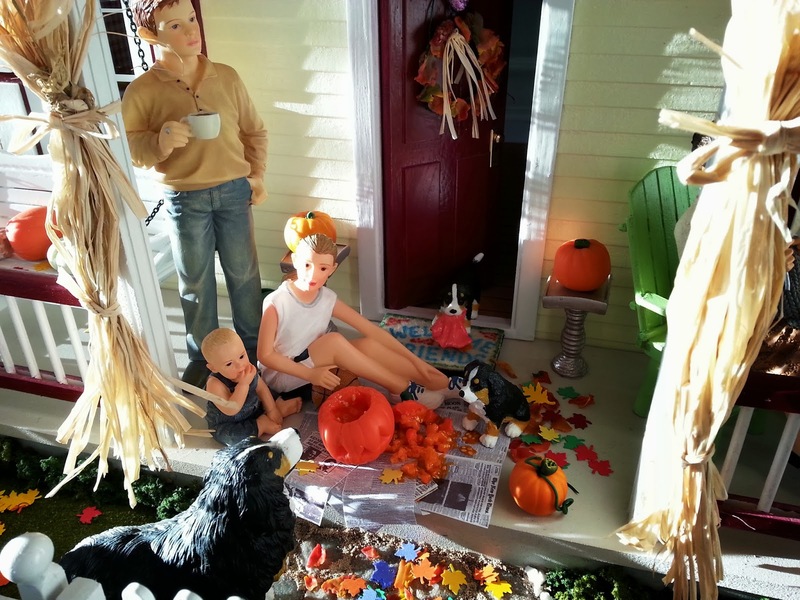 When I get the energy to go to the craft store I'll see what else I can find that is good to use in this setting. I love to cook, and I love clay. 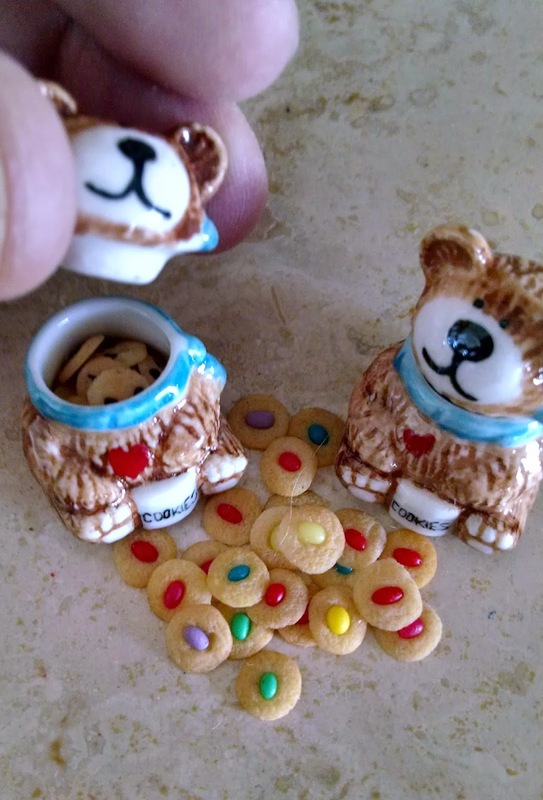 So I combined the two passions and started making miniature foods from polymer clay for my children's dollhouses. It's a great way to spend time with them. Creating 1/12 Scale Cake Stands!